If you are just starting to cook, or are moving in on your own, chances are, you don't have much in terms of cooking equipment. Here is what we recommend for you to get, as you are starting out. As times goes by, you will, of course, get more kitchen gadgets. - Chopping board. This is something very basic, as you can't chop anything without having a chopping board. It is very versatile, as you can chop pretty much anything on it - onions, potatoes, tomatoes, meat, herbs, etc. - A knife. Again, this is very basic, but you will not be able to chop or cook anything without a knife. A good, sharp knife goes a long way to help you prepare food. You can go to some stores, and hold the knives in your hand, so that you know which one you are comfortable with. - A big pot. You need a pot for pretty much anything - from boiling pastas to making soups to stewing to pretty much anything else. Some pots come with colander inserts, which makes it easier to cook pasta. Or, you may get a colander separately, and use that. - A saute pan. We love saute pans, and use them all the time. Again, they are very versatile, and we recommend getting ones without wooden handles, so that you can put the saute in the oven as well. - Roasting Pan. These are perfect for preparing things in the oven. From roast to roasted chicken to roasted vegetables, a roasted pan can help you cook your favorite dishes in the oven. Don't be scared - cooking is fun. 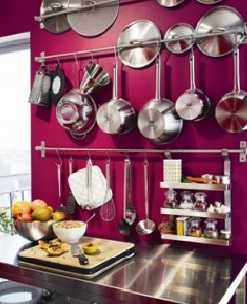 Start getting a few things that we recommended, and add to your collection of kitchen equipment as time goes.